These days, it seems, everyone’s a videographer. We can attribute (or blame) that phenomenon at least partly on the ubiquity of video on smartphones and consumer cameras. But now there’s a way for mobile filmmakers of all levels to push even harder beyond creative limits. 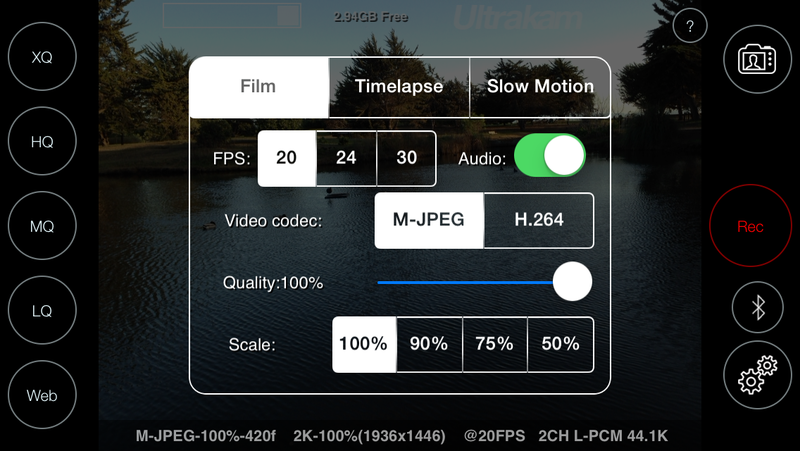 VFXWarrior today launched Ultrakam, the first and only iOS app that can record 2K video—a higher resolution than Full HD. “My vision is to create the most powerful tools for the next generation of content creators and to integrate mobile devices as a professional tool in content production,” said Hassan Uriostegui, the developer behind Ultrakam. The emphasis is both on high resolution and minimal compression. 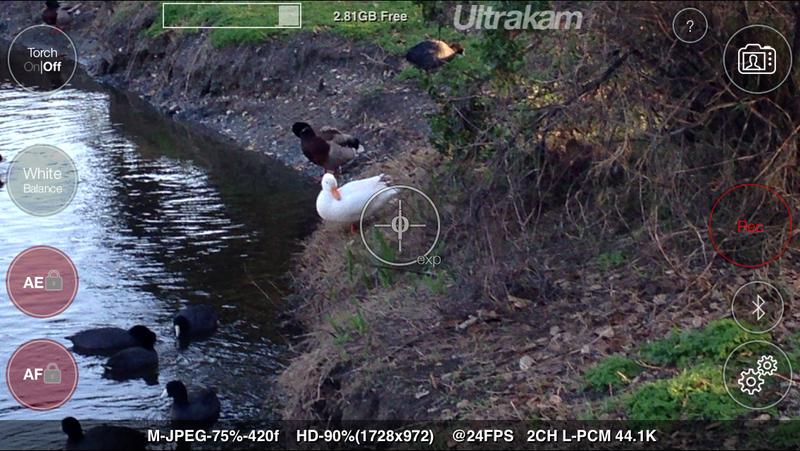 Ultrakam gives you control over all your shooting specifications, complete with notations at the bottom. Ultrakam works on late-generation iOS devices, including the iPhone 5s, 5c, and 5, as well as the iPad Mini and iPad 3. Each has its own hardware specs and thus the app has operational variations that conform to those limits. Shooting a movie with Ultrakam on the iPhone 5s using the H.264 codec, for example, yields the highest resolution possible from the software—some 70 percent more pixels (2240 x 1672) than Full HD with footage captured at 20, 24, and 30fps. When alternately using the M-JPEG codec, 2K resolution on the iPhone 5s has 35 percent more pixels than Full HD (1936 x 1446), at the same frame rates. 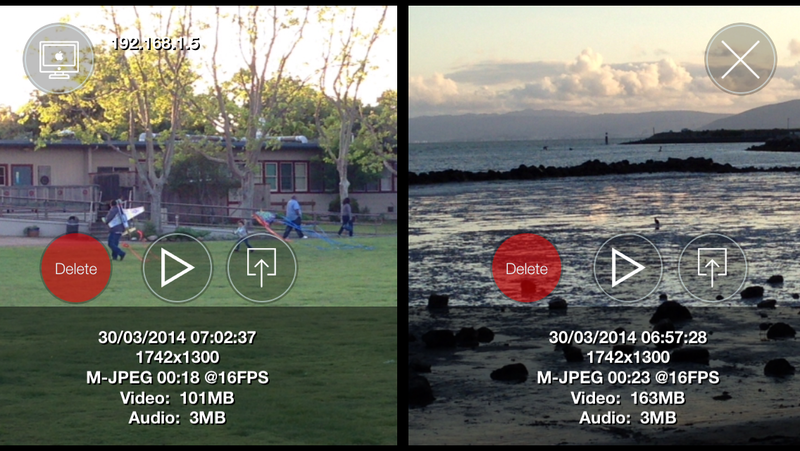 On the iPhone 5 in contrast, Ultrakam’s recorded 2K video yields 1936 x 1446, however that footage is only available at 20fps using the M-JPEG codec. iPhone 5 users can also record regular HD video at 24 and 30fps in both M-JPEG and H.264 codecs. In addition, Ultrakam lets you create 640 x 640 proxies in the player, so you can view and interact with smoothly running 2K material on your handset. 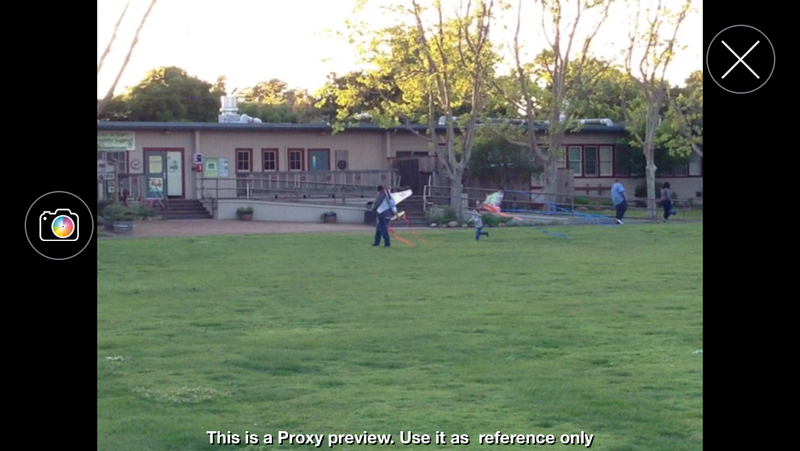 To view and interact with your video more easily, you can make a low-resolution proxy version. Though Ultrakam’s target audience spans a range from casual shooters to professional cinematographers, its developer designed the feature set with indie moviemakers in mind. In addition to high resolution capture, Ultrakam also provides special effects capabilities. Slow motion recording converts the 120fps video shot on the iPhone 5s to 12, 24,or 30fps on hardware that supports it. However, resolution is limited to 1280 x 720, with shooters able to choose M-JPEG or H.264 codecs to generate up to 10x slow motion effect. Timelapse resolution is 2592 x 1936 with either codec, with playback speeds of 6,12,24,and 30fps. The app also records CD quality audio in uncompressed Stereo Linear PCM format. Look for all your videos in the camera roll. “Ultrakam was designed working closely with indie filmmakers and we added what they asked for: timelapse and slow motion,” Uriostegui said. “This way, directors can easily switch between live action, timelapse, and slow motion recording with maximum quality and control.” All videos recorded with Ultrakam are accessible in the camera roll, where users can preview and delete recordings. Filmmakers can export movies recorded in the H.264 codec to share with other applications. Ultrakam also features a remote control panel for wirelessly transferring files from your phone or laptop, and is accessible via any Web browser connected to the same Wi-Fi network. If you need to quickly transfer files, you can also access them via USB or iTunes file sharing. 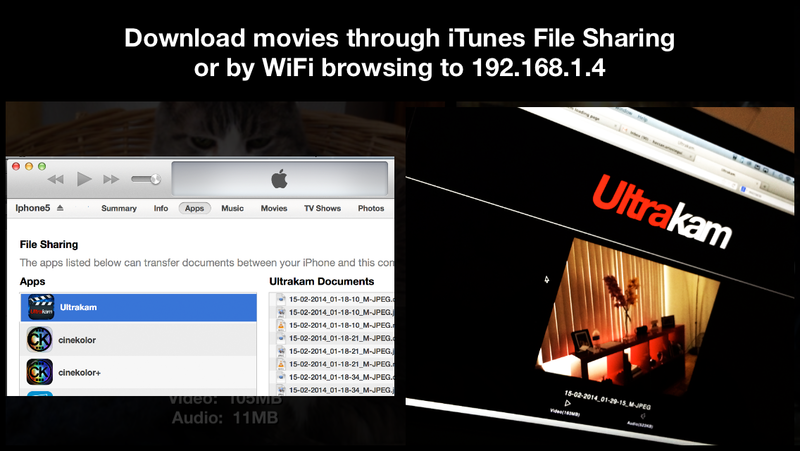 Pass videos from your phone to your Mac via iTunes file sharing or networking directly with your Mac. Users can play the files on the phone and preview the Audio/Video Sync via the app’s gallery. During playback, users can freeze and extract a video frame and send it to Ultrakam’s color grading companion app, Cinekolor. This allows filmmakers to start designing color looks that can be exported into programs like After Effects, Scratch, Lustre, or Nuke. For all its high level specs, I found that Ultrakam handled quickly and easily on my iPhone 5, with a simple, intuitive interface. Just point the phone in landscape orientation, and hit the red button. Controls for white balance, focus, and exposure are available, and just like in many sophisticated photo and video apps, you can independently lock both focus and exposure. A readout at the bottom of the window reminds you which specs you chose. To change those, tap the Gear icon to see a compact, elegant control grid that is easy to understand and swift to operate. Presets automatically give you a range of video qualities from the highest to the lowest and Web, with a single tap. Tap the play button to preview or halt playback. You can manually go forward and backward by dragging your finger across the screen. Control grid and presets make it easy to determine the quality of your movie. The new Ultrakam Remote Control app, released alongside Ultrakam, is a companion app for both the iPhone and iPad versions. This Bluetooth remote app lets you control shooting remotely with controls for focus, exposure, white balance, and recording. It operates only with Ultrakam installed on the shooting device. Ultrakam is a universal app for both the iPhone and the iPad and is now available on the App Store for a discounted price of $7.99 (the regular price will be $12.99). The Bluetooth-based Ultrakam Remote Control, is now available for a discounted price of $2.99 (with a regular price of $5.99). Both apps require iOS 7.